I use the term “post-mortem” deliberately, because the results of Israel’s election have been a sort of death for many Diaspora Jews and even Israelis who hoped finally to be rid of Bibi Netanyahu. There is a sense that Bibi, with his last minute racist pyrotechnics in effect stole the election, or at least manipulated it in a way that was truly horrifying. He invoked IDF Order 8, under which Israelis are mobilized to fight wars, in likening this election to a Israeli Jewish jihad against “Arabs” and “leftists.” In effect, Order 8 was like a dog whistle or Pavlov’s bell, summoning the masses to feed at the trough of hate. In shreying about the Arab masses running to polling places and foreign governments funneling shovels-full of cash to topple him, he appealed to the worst devils of Israel’s nature, to turn Lincoln’s quotation on his head. The results cannot but worsen the growing rancidness of the Likud vision of contemporary Israel in the noses of many Israelis, Diaspora Jews and the world at large. There is a growing sense that Israel cannot get itself out of the mess it’s in. The only way to do this is by beginning a process of gradual outside intervention. One way for this to commence is for the Obama administration to re-evaluate its relations with Netanyahu’s government (but not with Israel). A carefully calibrated set of UN Security Council resolutions that ratchet up pressure could pressure Israel internally into a process of soul-searching about its future. Major media outlets have bruited the possibility of the U.S. either supporting or refusing to veto a UN statehood resolution. We could also support a resolution we opposed only recently, to condemn Israeli settlements in Palestine. All we would have to do is whisper that we no longer look unfavorably on referring Israel to the ICC on a number of potential counts. Not to mention, the expected Iran nuclear deal. If there is such a deal and it is presented to the American public successfully, Obama will have another arrow in his quiver to use against Bibi. How this process goes is dependent on Barack Obama. For six years, he’s done nothing useful regarding Israel because he wasn’t willing to go to the mat for what was right. But now, Netanyahu has smeared his face in dogs(&t after the Congressional speech and the robo-calls warning that “Hussein Obama” would force Israel to capitulate to its enemies. The question is: is Obama riled enough to give Netanyahu the full treatment? According to a senior White House official, Obama told Netanyahu that the U.S. will need to reassess its options regarding the Israeli-Palestinian peace process in light of the prime minister’s new position rejecting Palestinian statehood. So far, as Bibi’s tried to backtrack from his rejection of the two-state solution the day before the election to his interview yesterday with NPR in which he pretended to re-endorse the concept (with significant caveats), Obama hasn’t bitten. He’s made clear that given the choice between Bibi, the pre-election rejectionist and Bibi, the post-election [re] convert, they choose pre-Bibi. This entire charade reminds me of the charge against John Kerry in 2004: that he was for the Iraq war before he opposed it–or was it the other way around? The difference is: everyone knows who Bibi is and where he really stands on the issue. He’s ag’in it. Obama too knows who this guy is. But is he willing to go head to head against him? Is he willing to bring him down? As the President contemplates these questions, he should consider Shibley Telhami’s Brookings poll of U.S. public opinion from December 2014. Then, 39% of Americans said they favored a two-state solution and a shocking 34% said they favored a one-state solution. In addition, 71% said that if Israel had to make a choice between its Jewishness and its democratic principles, they preferred democracy. This will only continue on an arc trending toward BDS, toward one-state, and toward an insistence on democracy over Jewish supremacy. There must be a collision between Israel’s conception of its future and the world’s and Israel must be brought to its senses before it’s too late. Let’s correct a few misconception about election coverage: the media is hailing this as a great Netanyahu victory. It isn’t. He didn’t, as Barack Obama did in 2008, draws masses of votes from centrist Americans, independents and even Republicans, to signal a great mandate for change (largely squandered, but that’s another story). What Netanyahu did was rearrange the deck chairs on the Israeli election cruise ship. There was no massive switch from left or center to right among the voters. The ideological divide remains as strong as ever. Israel is about one-third right-wing nationalist; one-third secular liberal; and the rest a combination of Orthodox, Palestinian, and left-wing. And that hasn’t changed. Because no party or candidate has come along to persuade people, as Obama did, to nudge their principles in one direction or another. Here is what Netanyahu did do: he cried out to that 30% of Israel’s right-wing voters to save him from disaster–and they did. He commanded them to return from the other right-wing parties with which they were flirting (mainly Bayit Yehudi and Yisrael Beitenu) and return home to Likud. And they did. Bayit Yehudi sunk from 12 seats in the most recent Knesset to 8 in the upcoming one. Yisrael Beitenu sank from 15 seats two elections ago, to 11 seats in the last election, to 6 seats in the coming Knesset. Likud won 20 seats in the last election and will have 30 in the coming Knesset. Essentially, those two parties lost those nine seats to the Likud. …”Doesn’t anyone else know you’re a humbug?” asked Dorothy. Returning to the election, the results hold true as well for the center-left coalition, the Zionist Camp, for which liberals the world over held out so much hope. In the past Knesset, Labor had 19 seats and Livni’s Ha’Tenuah held 6. In the next Knesset, the combined Zionist Camp will hold 24 seats. That’s actually a net loss for them of one seat. The other major loser was Yair Lapid’s Yesh Atid, which went from 19 seats in the past Knesset to 11 in the upcoming one. Many of those lost seats went to the new Flavor of the Month, Moshe Kahlon’s Kulanu Party. That’s why I alluded above to Bibi rearranging the deck chairs on the Titanic. He will move from a governing coalition consisting of far-right nationalists and center-right “moderates” to one shorn of virtually all the moderates (Lapid and Livni’s parties will be gone). Instead, he will probably have to turn to the religious parties like Shas or United Torah Judaism, whom he spurned in the last coalition. What’s the difference? The other option is a “national unity” government as advocated strongly by President Rivlin. This would be an abomination and betray the votes of both those on the left and right who supported their parties based on the ideological platforms. But as we know from the past, Israel politicians barter their principles as often as they trade stocks on the Tel Aviv stock exchange. Finally, and in league with what I wrote above: those who put their faith in Israeli electoral politics to bring the changes needed in Israeli society and its foreign policy are deluding themselves. Even had the Zionist Camp won, there would’ve been little real change inside Israel: possibly some new economic reforms and a few bones thrown to the moderate left and maybe even some to Israeli Palestinians. There’d be a few less evictions from Bedouin villages in the Negev, a few less illegal settlements (perhaps), maybe a shorter war with Hamas or Hezbollah than under Bibi. But the changes would’ve been nibbling around the edges of the real problems. A centrist government would’ve been no more able to sign a peace deal with the Palestinians than Bibi has been. And it would have little interest in making the fundamental changes needed to transform Israel into a truly democratic society. Changes which will be necessary to ensure its long-term survival as a democratic state. “Rearranging the Deck Chairs” : This exactly what he was hoping for! You also forget Kahlon is the Right Wing version of Yesh Atid, not simply center, and Yahad of Eli Yishai lost the right 4 seats (which would total in probably 2 extra seats for the right as a whole). Today’s NYTimes exposes a supposed “dilemma” for Hillary Clinton position towards Netanyahu whether to support him and anger her democrats base who will therefore turn against her and support every republican flavor or deny him and therefore give the republicans the upper hand having selected a “winner”. For all my pain I cannot see this government reach the 20 odd months before 11/16. if then. First he’s cut EVERY PARTY THAT HAS JOINED HIM as i previously mentioned (lapid, liberman. benett, barak and so on) so will Kahlon join the long list of disappeared parties, further Netanyahu’s motto is Louis XIV’s “Le solei c’est moi” therefore Kahlon will do whatever ONLY AND SOLELY BENEFITS THE NETANYAHUS . The future coalition is fraught with fights, the first will be with Benett whom Bibi destroyed by his last minute antics and the results will be at the base of Benett’s party destruction and will not receive his ambitions. The remaining ultra orthodox will be bought with a plate of beans. This is the third election in 6 years, the average gives us 2, and should Kahlon adopts same M.O. as Lapid did in the previous coalition, he should be fired very shortly because he will prove a spine hard to swallow for Bibi, Further Kahlon departed Likud because of Bibi, Should be also look at this past as indicative of the future. I believe we should. What is horribly sad is that Kahlon has chosen to disregard the international tsunami heading this way for his “economic reforms”. talk about cutting your nose to spite your face. How will this work out when BDS will be the law of the land and the word “sanctions” will slowly creep in Europe’s language. This coalition is not grounded solid enough to last 2 years if that much. I HOPE. Let’s be honest here, Hillary is as corrupt and deceitful as Netanyahu. Look at the history here. We can shoot for optimistic hypotheticals here, but not with Hillary in the equation. IF she wins, and that’s a big IF, we’ll be kicking ourselves and missing the days when Obama was president, for all his imperfections. You are quite correct to point out that the voting public didn’t lurch either to the right or to the left, nor even towards the centre, and that the only thing that actually happened was that voters switched their support from the smaller right-wing parties to that Honkin’ Big Right-Wing party that is Likud. What *is* different is the reason why they fled from Bayit Yehudi and Yisrael Beitenu and flocked to Benjamin Netanyahu. Because up until two days before the election all those right-wing votes appeared to be set in stone, hardly budging an inch despite all the hoopla and all the hollering. Yet when Netanyahu dropped all pretence to statesmanship by blowing the racism whistle all those crusted-on supporters of Bennett and Lieberman liked what they heard and raced to his side. It is to Netanyahu’s eternal discredit (I was going to write “shame”, but the man is clearly shameless) that he flaunted his racism, but it is to Israel’s shame that so many voters were so obviously determined to cast their vote for the most openly racist candidate. Clearly that was Netanyahu, and that’s why they voted him back in. 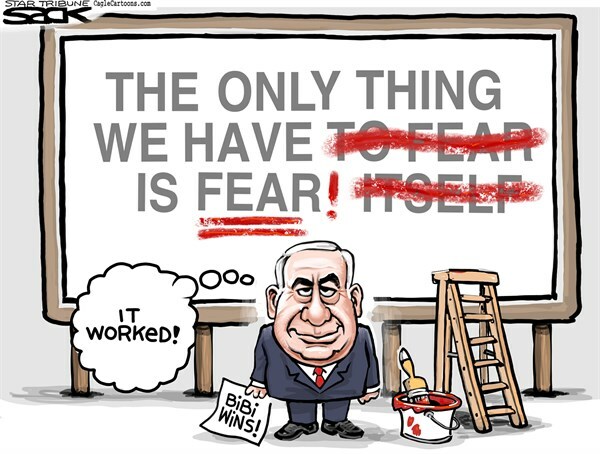 The Israeli public can take the blame or credit for Netanyahu. I can see the point that some have made that this outcome is better than the other because really things have to get worse before they get better. I have felt this for years now, that, unfortunately, Israeli’s will have to suffer enough. I am reminded with regard to Netanyahu’s duplicity, of the complaints made about Arafat lying, during, after, before Oslo. The claim was that he was not credible because he was saying one thing to his people in Arabic and something else to the rest of us in English. The attack on the author Yonatan Geffen (who had called Mr. N. a racist) indicates a sinister development: violence and intimidation becoming the main means of political “communication”. There is a very, very interesting line of commentary, on a verse of the Qur’an, written by someone named Bashirruddin, that predicted, probably back in the early ’50s, that the State of Israel, as a nation, was a temporary phenomenon. Of course, Bashirruddin was accused of being anti-Semetic. But, it appears to me that the most anti-Jewish people themselves are the Zionists and racists that “love” Israel. They will love Israel TO DEATH. Hezbollah, Iran, Syria, and the entire “Resistance” would do well to consider re-direction its money from armaments, as their defense (or, as some believe, planned offense) against Israel. Because, with Bibi back in the saddle, Israel does not have to be worried about being attacked with physical weapons, or with Hezbollah armies. Because Israel is, obviously, very capable of destroying itself. And perhaps that is what Bashirruddin was able to see: the suicide of the Israeli state.